Posted on 4th March 2019 at 1:46 pm. Mark McCormack/Simon Ryan – Create the Great in You Ltd.
Posted on 4th March 2019 at 1:29 pm. Mark has been accepted on an Advanced Leadership Programme based in the K Club Straffan Co. Kildare. A special thanks to Mr John Killeen & Ronan O’ Farrell for this fantastic opportunity in supporting the work carried out by Create the Great in You Ltd. Leadership is a challenging business from which an unending stream of complications crop up. The Timoney Leadership Institute Advanced Leadership Programme has been designed to train leaders to grow and develop as they learn how to rise to these challenges. The ALP programme will achieve this through insights and discussions with world-class professors from Harvard Business School, the IESE Business School, (ranked number one in the world in 2015, 2016, 2017 and 2018 by the Financial Times for executive education) and several other leading business schools from across the world. Mark continues to work on his own self-development and has been accepted onto a prestigious leadership and self-development programme at the Timoney Leadership Institute in Dublin. The Advanced Leadership Programme is delivered over a five month period and is designed to equip participants to better manage situations, create leaders and develop the entrepreneurial mindset. The Timoney Institute works in partnership with Harvard and IESE Business School, which was ranked number one in the world in 2018. Posted on 5th September 2018 at 6:15 pm. 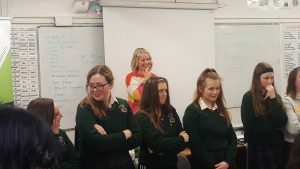 Learn more about our programmes in this interview with the TY students and coordinator from O’Carolan College in Nobber, Co Meath. Posted on 29th August 2018 at 5:57 pm. We’re delighted to be speaking at this event hosted by the Newry Junior Chamber on 19/9/2018.